I love twitter! There, I have met some awesome educators, had great little conversations with amazing folks about education and my PLN (personal learning network) has grown since I started tweeting eight years ago… I didn’t like twitter at first, but once I realized the potential for connecting and sharing with other educators, I was hooked. I realize that my work in education is one thing in life that gives me incredible joy! I love this work, the creative component of designing instruction that makes kids laugh and love learning motivates me to work hard and for long hours (I’m known as a hard working’ momma in my house). Sometimes twitter brings me little gifts that are presents from people whose lives I’ve touched through the professional development I have led on Guided Inquiry Design. And today, just now, was one of those moments. And so in the spirit of my Quaker education I have been rightly moved to share this with you all. 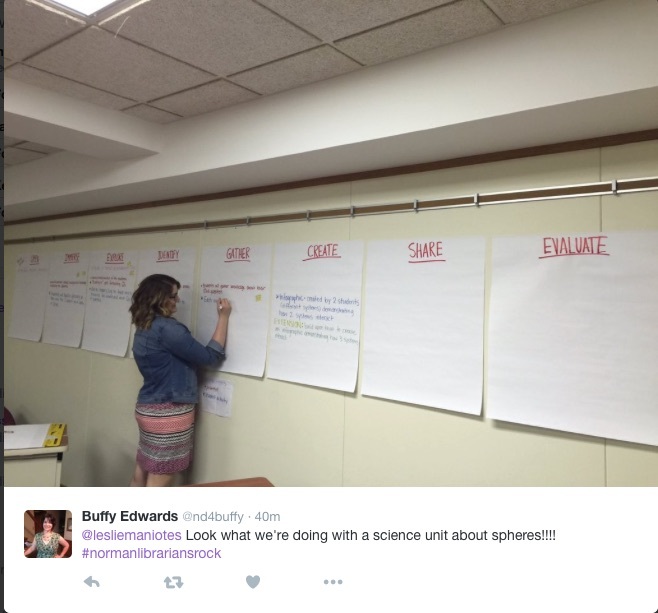 But I digress… so the leaders (Kathryn Lewis, Shirley Simmons and Beth Spears) in Norman decided to do it right. What does “doing it right” look like? 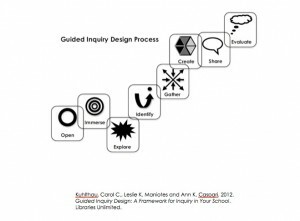 Well, we have had 3 full Guided Inquiry Design Institutes where I taught teams to “fish”. Librarians, instructional coaches and teachers learned about the design and how to design units of inquiry together. They were looking for K-12 implementation so at lest one team from each school came to an institute this year. So I got a tweet from Norman today that was evidence that they are fishing, big time! I have to take it back a little, because today’s tweet has a little backstory. This one elementary librarian Kelsey Barker, during the institute, decided to visualize the plan for her team. I love the way she used post-its to mirror the process as a visual aide to her team’s design process. This photo was taken at one of the institutes this fall. I placed the picture next to the GID process so you can see the match. She used a sticky note for each phase while the team was developing their design and then placed them in line just like the process. This was a summary of their plans, not their entire thing but a synopsis to be sure they captured the essence of each phase. 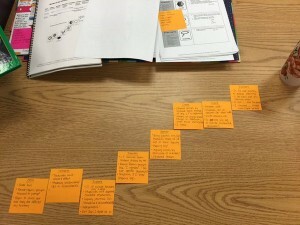 The district leaders asked each school to implement one unit this school year, but as Guided Inquiry does when people have a deep understanding of the process and all the components, it began to take hold. At some schools, like Kelsey’s, the people who attended the PD welcomed more designing and more implementation, as they saw the effects on student learning, and engagement. IKE was one of those places. A few months later, I got another image, as Kelsey was working with another team at her school to design yet another unit. (See photo) I was a proud teacher at that moment because not only was Kelsey able to continue beyond district expectations, she was still grounded in the materials from the Institute (Institute notebook in the background). She was referencing the phases true intent while designing and clearly showing that “inquiry stance” (as opposed to a ‘know it all’ stance). Kelsey was taking risks and applying everything that she had learned in our time together. And, today they have gone BIG! I just got this tweet showing that they continue to use this format as a way to plan. This plan is more public. Using large stickies like this is a great way to make a plan and then get feedback right on the phases. It makes the thinking transparent for all to see and opens the conversation. This happens to be a group of five working to design a unit of science on spheres for the district. In this case, large stickies was the way to go! That’s Kelsey in the picture and Buffy took the photo, thought of me, and tweeted it out! Thank you ladies! These things make me so proud and happy, you have no idea. 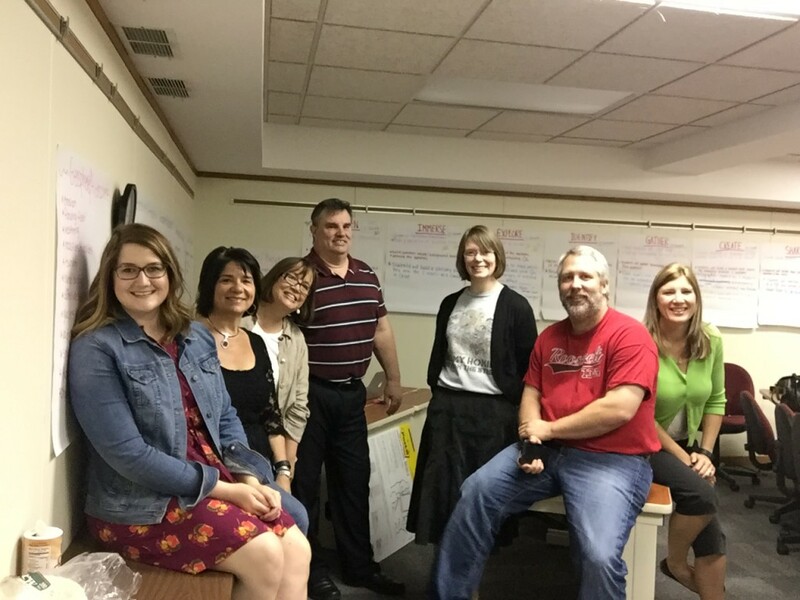 Because of the PD, the educators in Norman are continually showing how they can extend what they learned in those intense 3 days and not just stop with that first iteration. This is only one excellent example of all the good things happening with GID in Norman. Good learning runs deep. That’s what we want in our PD for teachers, learning that can be extended and applied in a multitude of ways. And, it’s what we want for our students. 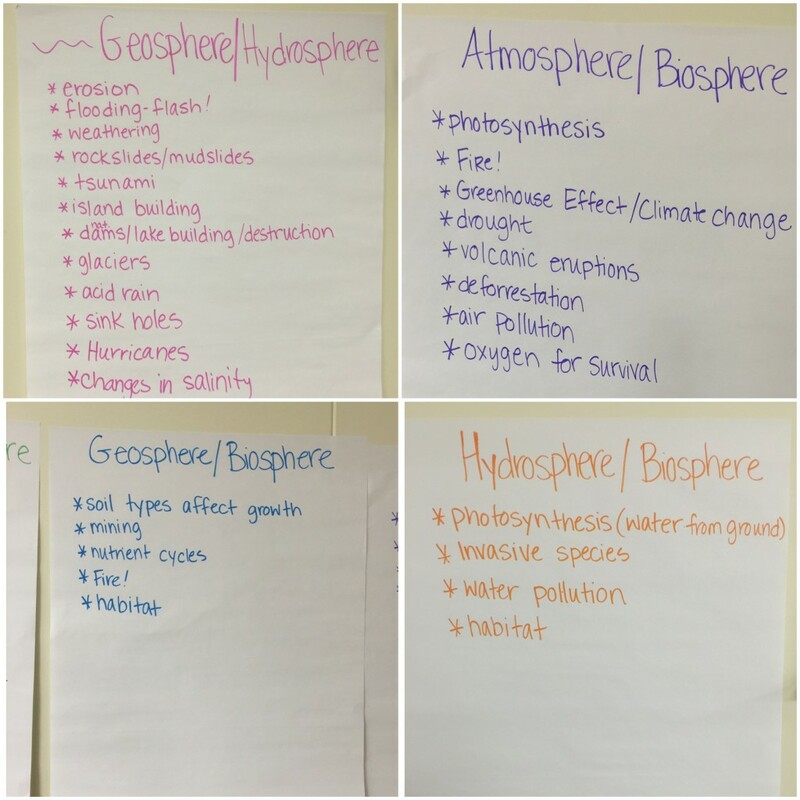 We want to provide a rich context for learning. We want to connect learning to life where what students learn doesn’t only stay in the classroom but connects outward in a multitude of ways. Learning can be applied and transferred to other areas of life when the learning runs deep. The Guided Inquiry Design Institute did just that for these folks. And, I couldn’t be more proud!